Priced per L/F (minimum charge applies). We stock over 60 Colors of 3/4" Binding. We stock over 30 Colors of 1 1/4" Binding. Plus 180+ colors are available to us. Proudly serving Iowa and Nebraska since 1956 . Priced per L/F ( minimum charge applies). Serging tape duplicates the look of wrap-around serging. Made of 100% Cotton. 84 Colors available through special order. We can cut the base for you...or just bind it. We stock over 60 Colors of 3/4" Binding. Plus 180+ colors available as special order. 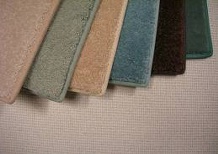 We can attach a non-slip or felt backing to any rug at an additional fee. 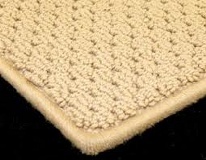 Additional cut charges may apply for cut-to-size rugs or to re-trim. of the colors we stock. We stock over 50 Colors of yarn. Plus more colors are available to us.